School busses line up at the Jordan River National Fish Hatchery during a field trip. Photo Courtesy of Jordan River National Fish Hatchery. Most students eagerly look forward to field trips throughout the school year because they can be both educational and fun. 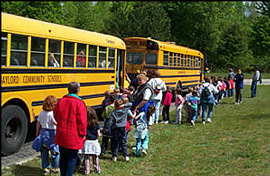 Field trips expand learning opportunities for students in many subject areas. Science students, for example, may take a field trip to a science museum or to a laboratory to gain a better understanding of scientific principles. Science field trips for older students often involve visiting different sites to collect data for research purposes. Social studies field trips often include visits to historic sites, where students can get a better feel for the history they learn in the classroom. Places where students can observe civic leaders in action, such as legislatures, or courthouses are also popular destinations for social studies field trips. Music teachers usually take their students to live performances, to help their students increase their appreciation of different kinds of music. Art students usually visit art museums so that they can learn about specific kinds of art or about the art of particular era. Drama or literature classes sometimes take field trips to see plays that they have studied being performed.